Frenetic weekend antics in a French château, where the extra-marital dalliances of elegant members of the Parisian high life are played out, and the whole facade of a respectable social order exposed during an elaborate party: no, it’s not just Jean Renoir’s sublime La Règle du Jeu, it’s also one of the greatest 1930s American romantic comedies, Midnight. Both films were released in spring and summer of 1939, on the brink of the Second World War, and while on its glossy surface the Hollywood film’s tone is ostensibly lighter, less overtly tragic than the French film, Midnight‘s title suggests that the fairy-tale world on opulent display has reached the end point of its existence. Once the clock strikes, this fantasy vision of a Europe governed by a frivolous elite will, in the harsh light of political reality, be reduced to ashes and cinders. While Renoir’s films are usually regarded as pre-eminent examples of auteurist cinema, it is easier to consider Midnight a hybrid confection of fabulous inauthenticity whipped up by the American studio system’s homegrown talents working hand in hand with European émigrés fleeing Nazi persecution. In effect, the film is a testament to the power of the studio system to energize talent, regardless of its origins, towards apparently seamless works of collaboration dedicated to celebrating American values. 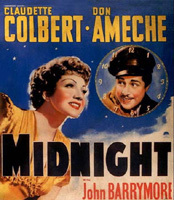 Mitchell Leisen’s reputation as a great visual stylist was previously established through his work as Cecil B. DeMille’s art director in the ’20s and Midnight is the summit of his career: the movie literally looks like a million bucks, since the budget was a lavish $1,025,000 – according to David Chierichetti, $300,000 more than his other great screwball comedy, Easy Living (1937). (1) This is a product, not only of the elaborate mise en scène, but also of Utah-born Charles Lang’s cinematography, which positively glows with burnished elegance, flattering every subject. Popularizing European artistic trends, the film’s art directors riff on surrealism in the stunning de Chirico-inspired mural and props in Simone’s hat shop, thereby satirizing European high culture, but also drawing inspiration from it and making it all look impossibly glamorous. And the words out of the characters’ mouths are a mix of Billy Wilder’s cosmopolitan Viennese-Jewish cynicism and Charles Brackett’s no-nonsense Yankee idealism, while Frederick Hollander’s eclectic mix of music (from the waltz to the conga) demonstrate Hollywood’s power to assimilate the Old World into the New to evoke a world that is, poignantly, even more spectacularly ‘European’ than the real Europe (by contrast, Renoir’s beau monde is somewhat visually threadbare and dowdy). It’s a dream of what was left behind, what could never be really possessed, or never really existed, but was soon to disappear. But since Midnight wears its concerns lightly, no overt reference is made to the looming clouds of war until the end, in the mock divorce trial, when Judge Monty Woolley refers to the “time of vast world unrest” which seemingly renders the farcical proceedings trivial. In both films, the aristocrats walk away from the convulsive messes they make; but Midnight ultimately valorizes, in a predictable way for a Hollywood film, the ’30s populism embodied in Don Ameche’s character, the taxi driver Tibor Czerny. The film endorses the entrepreneur who arises from the working classes, since Tibor rejects whatever aristocratic heritage he has and is content to hustle just enough business to live happily. Indeed, it’s difficult to remember that he isn’t American, and Ameche, like the other American actors playing Europeans, makes no effort to adopt a foreign accent. And this being screwball comedy, Midnight lauds his eventual mastery over the knowing, independent, rootless American ‘gold-digger,’ whose material acquisitiveness sets the film’s comic plot spinning into high gear. While there is just enough cynicism in the script to make us doubt Eve’s willingness to live on 40 francs a day, Tibor’s exuberant claim that he can make even more than that to make her happy is all of a part with standard narrative resolution in classic American romantic comedy. Individual male achievement, purposefully harnessed to conventions of married domesticity, transcends class status. So while we may be inclined to doubt Eve’s pledges of fidelity and domesticity at the end, it’s his promise to be the bread-winner that reassured late ’30s American audiences of the triumph of solid male bourgeois individuality over all other values, especially feminine and aristocratic. While Tibor is a humorless fish out of water at the Flammarion country estate, where his stolidity can’t outmatch the witty decadence of the aristocracy and their hangers-on, the film resolves itself in his favour by finishing up in a court of law, where even abusive patriarchal authority is articulated and endorsed. Still another feature which distinguishes Midnight as an archetypal American film is its lack of interest in the servant classes. Their general absence from the foreground of Leisen’s film attests to American ideals of a classless society, one priding itself on immunity to the destructive disruptions of a social hierarchy such as are on display in Renoir’s film. The ease with which Midnight resolves the conflicts it sets in motion stands in stark contrast to the traumas of expulsion and death endured by some of the characters in Renoir’s film. In effect, if both films are ultimately about the degree to which a culture has the confidence to survive the inevitable upheaval of war, Midnight is an optimistic fantasy reassuring audiences of the superiority of American culture, however much it’s displaced onto a Europe that really consists of the process photography of a tourist’s Paris and some plaster Art Deco sets on the Paramount lot. David Chierichetti, Mitchell Leisen: Hollywood Director (Los Angeles: Photoventures Press, 1995) 118.